​Will Vietnam repeat AFC U23 miracle in futsal? Vietnam will face hosts Taiwan at the 2018 AFC Futsal Championship on Monday and need nothing but a win to qualify for the quarterfinals, a feat the country miraculously pulled off in association football last month.Taiwan are Group A leaders with four points, followed by Vietnam and Malaysia with three points each.The Golden Stars will secure a ticket to the knockout stage if they beat the hosts at 6:00 pm (Vietnam time) today.Vietnam lost 1-2 to Malaysia in the event’s opener on February 1, before beating Bahrain 2-1 on Saturday.Taiwan have been a surprise at the competition as they drew 2-2 against Bahrain in the opener and defeated Malaysia 5-4 in the second game to top Group A.Except for one-point Bahrain, all the other three contenders still have equal chances to advance, meaning Vietnam should make no mistake in the clash with Taiwan.The Taiwan test is expected to be a tough one for the Golden Stars, even though they hold the upper hand over the hosts. 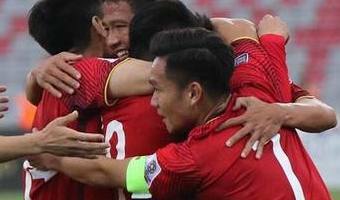 Vietnam rank 55th on … [Read more...] about ​Will Vietnam repeat AFC U23 miracle in futsal?